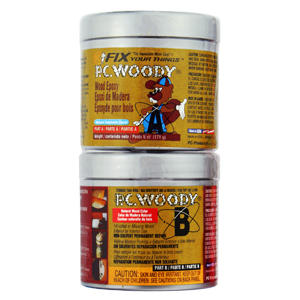 PC-Woody® is a two part epoxy paste that is excellent for filling cavities in wood. 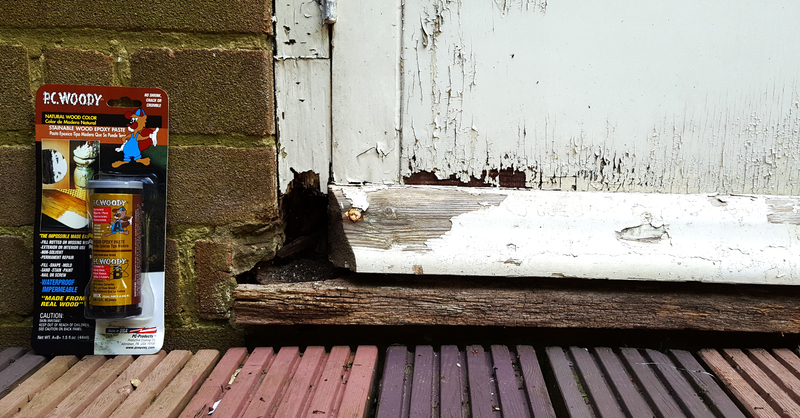 Make permanent repairs without shrinking, cracking or popping out of exterior wood. Sand, drill, nail, prime and paint or stain. Bonding filler for replacement wood. Not brittle. Easy 1:1 mix ratio.n is slow curing, but slow can be a good thing especially for large tasks. Log homes, furniture, window and door sills and more. Fill holes from wood knots in garden gates. Remove loose paint, wood fibers and debris with stiff brush, sandpaper or scraper. Remove contaminants such as dust, dirt, oil and grime with a solvent such as denatured alcohol (ethanol), acetone, rubbing alcohol (isopropyl alcohol) or lacquer thinner. Wood that has been damaged by rot, termites or carpenter ants should be treated with a wood hardener such as PC-Petrifier® or PC-Rot Terminator®. Clean up mixed epoxy before it cures with paper towels and solvent. Denatured alcohol (ethanol), acetone, rubbing alcohol (isopropyl alcohol) or lacquer thinner are suitable solvents for removing uncured epoxy. It can also be removed with paint stripper or remover. PC-Woody® contains real wood and will accept stain after sanding. However, stained PC-Woody® rarely matches the surrounding wood color. It is possible to tint PC-Woody® but matching colors is difficult with pigments or universal color dispersions. Darker tinting is less obvious than lighter. Should PC-Woody® be applied in layers? How thick can PC-Woody® be applied? PC-Woody® can be applied in layers but it is not necessary to do so. After PC-Woody® part A and B have been mixed they will cure through without the need of drying or exposure to air. The only thickness limit may be on vertical surfaces if it slumps. Will PC-Woody® shrink or pop out? PC-Woody® is slightly flexible allowing it to move with changes in the wood. It can expand and contract. PC-Woody® is sandable but can it be carved or filed? Can a wood-turner put it on the lathe? PC-Woody® has been carved. Sculptors have used it successfully to fill gouges and missing wood. PC-Woody® can be turned on a lathe but it will do so differently than wood. Wear a respirator and ventilate mechanically. What grit sandpaper is good for sanding PC-Woody®? Can a mechanical sander be used? 80 grit sandpaper work nicely to reduce cured PC-Woody®. Fine sandpaper such as 120, 150 and 180 can also be used. Mechanical sanders work best after 48 hours. Wear a respirator and ventilate mechanically. Is the PC-Woody® suitable for structural repairs? Consult an engineer for critical structural applications. PC-Woody® is suitable when used in conjunction with new wood or steel supports. After PC-Woody® cures, is it possible to turn a screw or hammer a nail into it? PC-Woody® will accept various sized screws and nails. It is best to drill a small pilot hole first. Does cooler weather affect the way PC-Woody® cures? PC-Woody® will require additional time to cure at cooler temperatures. Temperatures below 50° F may require a heat source such as a heat lamp to accelerate the curing. It is not recommended to apply PC-Woody® at temperatures at or below freezing. Very cold temperatures will pause the reaction until temperatures rise. How soon after application of the PC-Rot Terminator® can the PC-Woody® be applied? It is best to wait until PC-Rot Terminator® has fully soaked into the wood before applying PC-Woody® but it is not necessary to wait until PC-Rot Terminator® has fully cured. The PC-Woody® part B is not drying. PC-Woody® part B must be mixed with PC-Woody® part A in equal volumes. The PC-Woody® part B will not cure by itself and must be removed and mixed properly. It is not recommended to mix PC-Woody® in teaspoon size increments or smaller, simply because of the likelihood of an ‘off-ratio’ mix. Be sure to mix equal parts of Resin to Hardener 1:1. Is it ok to mix PC-Woody with stain to make it darker? Stains will often settle. This sediment can be used to tint the PC-Woody® in some circumstances. Better to use dry pigment powder to achieve darker shades. The PC-Woody® part B is dark and has a little bit of oil on the surface. As PC-Woody® part B ages it can become darker and separate. 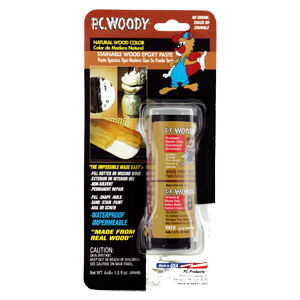 Stir any liquid back into the PC-Woody® before using.